In honor of St. Patrick’s Day next weekend, I give you this bowl of heaven. The recipe was from the March issue of Food Network Magazine (the CHEESE issue…I mean, honestly). I don’t know how much more I can say that the name of the recipe doesn’t already say a million times over. I made this exactly as directed and froze the rest of the filling and dough for future pie eating. Sometimes you just don’t need to mess with perfection. 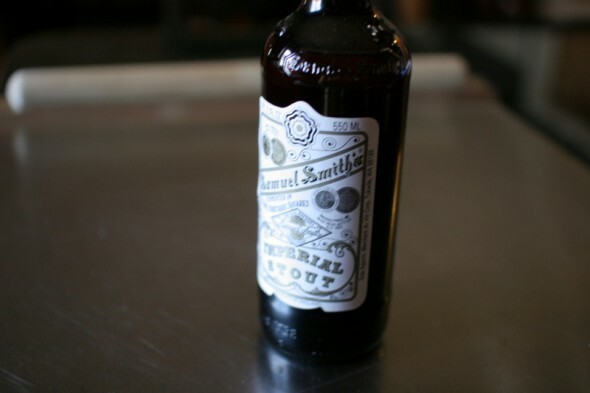 To pay tribute to the incestuous and oft-overlooked relationship between Irish and English cooking, and for my Brit husband who will never understand about St. Patrick’s Day, I used this English stout instead of the obvious choice. I thought the label would made me look like I know stuff in the Whole Foods checkout line. 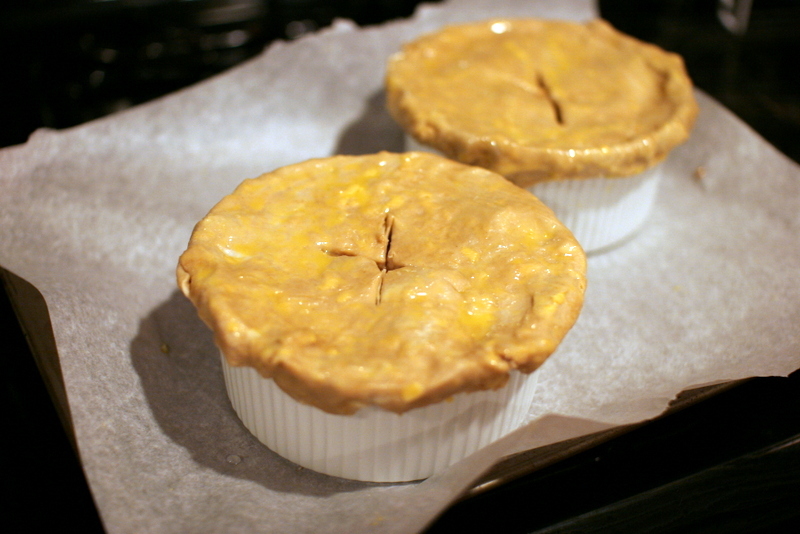 Side note: do you like my new individual pot pie bowls? I’ve been spending time in Williams-Sonoma this week. Make the dough: Pulse the flour and fine salt in a food processor to combine. Add the butter and cheese and pulse until the mixture looks like coarse meal with some pea-size bits of butter. Drizzle in 6 tablespoons beer and pulse to combine. Squeeze the dough between your fingers; if it does not hold its shape, pulse in up to 1 more tablespoon beer. Pat the dough into a disk, wrap in plastic wrap and refrigerate until firm, at least 1 hour or overnight. 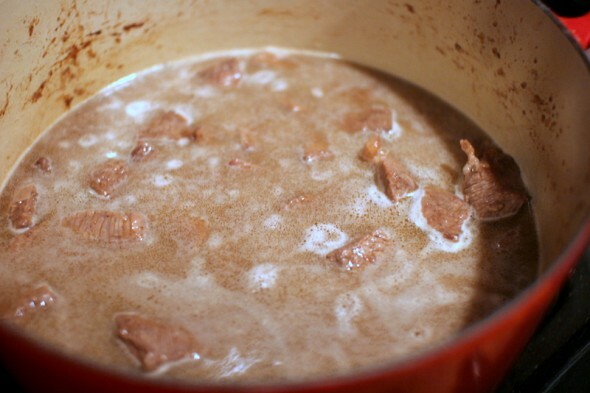 Meanwhile, make the filling: Preheat the oven to 325 degrees F. Toss the beef, flour, 1 1/4 teaspoons kosher salt, and pepper to taste in a large bowl. Melt the butter in a Dutch oven or large ovenproof pot over medium-high heat. 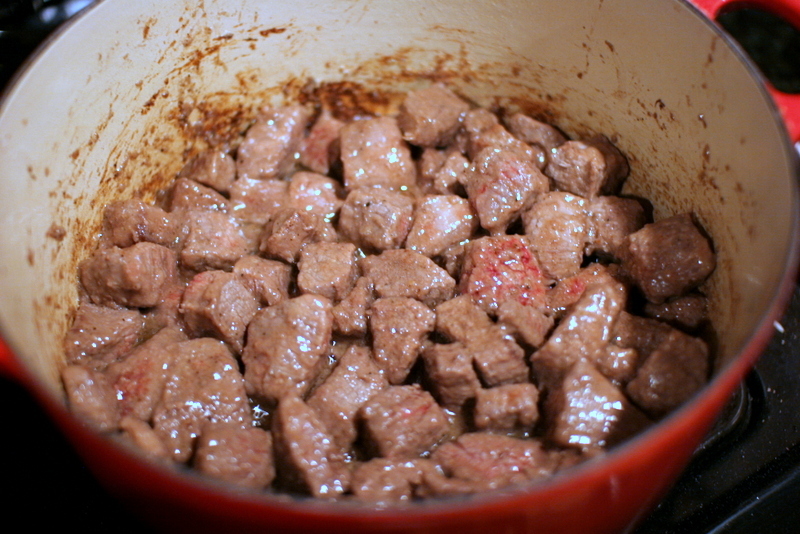 Add the beef and cook, stirring occasionally, until browned all over, about 7 minutes. 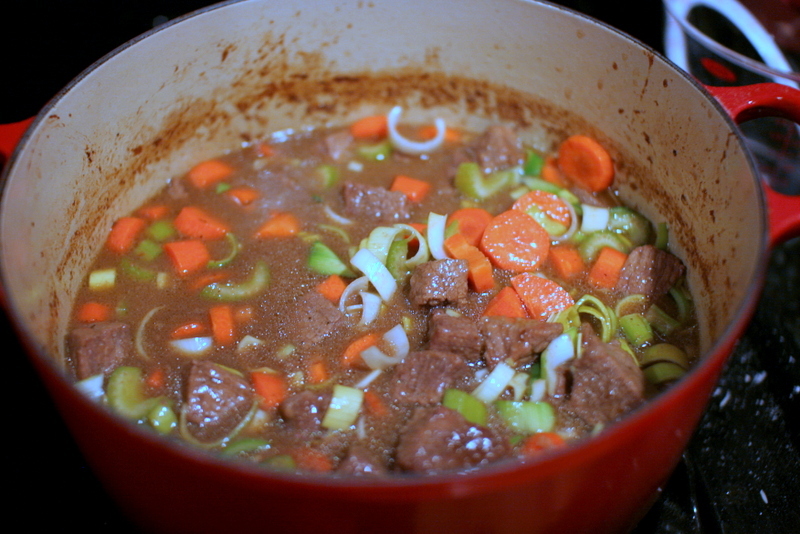 Add the beer and 2 cups water, scraping up any browned bits from the bottom of the pot. and continue braising, 1 more hour. 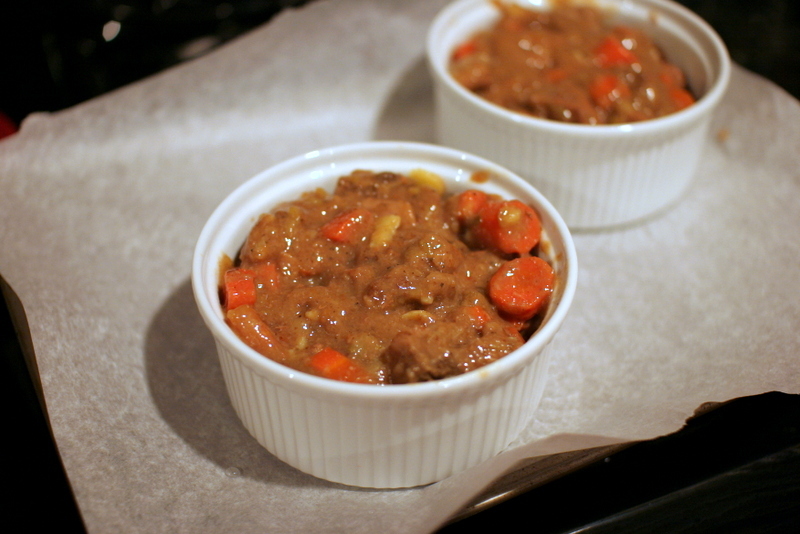 **The recipe doesn’t mention this, but I skimmed a ton of fat off the top off the braised meat. In fact, I made the meat the night before we had this for dinner, and when I took the pot out of the fridge the next day I was able to get a whole lot of chilled fat off the top. Gross, but necessary. Meanwhile, put six 10-ounce ramekins on a parchment-lined baking sheet. 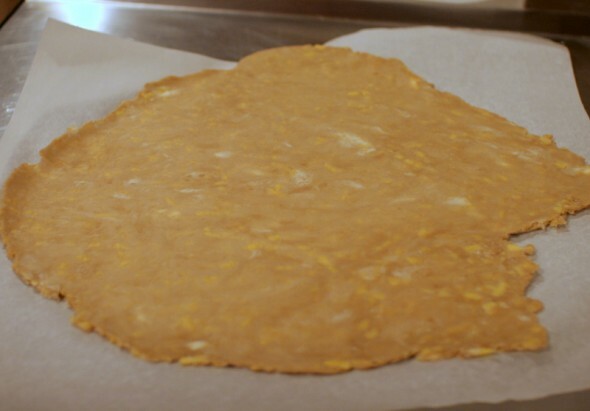 Roll out the dough between 2 lightly floured sheets of parchment into a 10-by-15-inch rectangle. (I can’t make rectangles). It looks crazy all studded with cheese, doesn’t it? Cut into six 5-inch squares. Make a few slits in the middle of each square to let steam escape. **Note: I only made 2 for dinner and froze everything else. Remove the filling from the oven and increase the temperature to 375 degrees F. Season the filling with salt and pepper and divide among the ramekins. 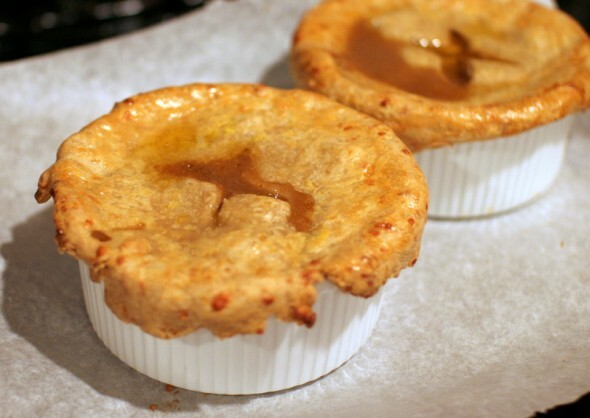 Top each with a square of dough, pressing the edges into the ramekin. Brush with the beaten egg. Bake until the crust is crisp and golden brown, 35 to 40 minutes. Let rest about 10 minutes before serving. Oh my goodness, these look amazing! I found your blog through my friend Jennifer Specter and I’m enjoying checking out all your great photos, recipes and crafty stuff!